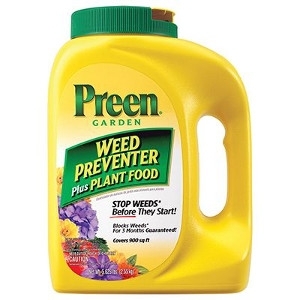 Preen Garden Weed Preventer plus Plant Food prevents weeds and feeds plants in one easy step. Balanced fertilizer promotes abundant blooms, increased yields and strong root development. Safe for use around over 200 established flowers, vegetables, trees and shrubs. One application fertilizes your plants and prevents weeds for up to three months.